Bottled Blonde has seen better days. The maligned River North restaurant and bar at 504 N. Wells St. has caught flak over the last week for a lengthy dress code that is viewed by many as racist and classist. And now, residents might be on the way to getting their wish of having the popular nightlife spot booted from the neighborhood. With a flood of complaints for noise, litter and drunken patrons since Bottled Blonde opened in 2015, city investigators reprimanded the pizzeria for operating primarily as a bar instead of a restaurant, against the terms of their liquor license, according to records from the city’s Department of Business Affairs and Consumer Protection. The owners agreed last September to clean up their act with a “revised liquor license plan of operation,” promising to put up more trash cans, keep the sidewalk clean and limit a single-file line outside to 25 people. City officials reiterated that alcohol sales were to be “only incidental to the food service,” the agreement said. But investigators said last month that Bottled Blonde was still running primarily as a bar, leading to a new round of disciplinary hearings that could put their license at risk. At a brief hearing before the Local Liquor Control Commission on Tuesday, attorneys agreed to meet again next month. Miriam Waltz lives in a building nearby. She said the restaurant was initially billed as a family restaurant before it opened. It soon became clear that wasn’t the case, she said. “There’s fighting in the streets,” Waltz said. “People urinating and vomiting in the alley. I’ve been accosted in the lobby of our building by drunk patrons. 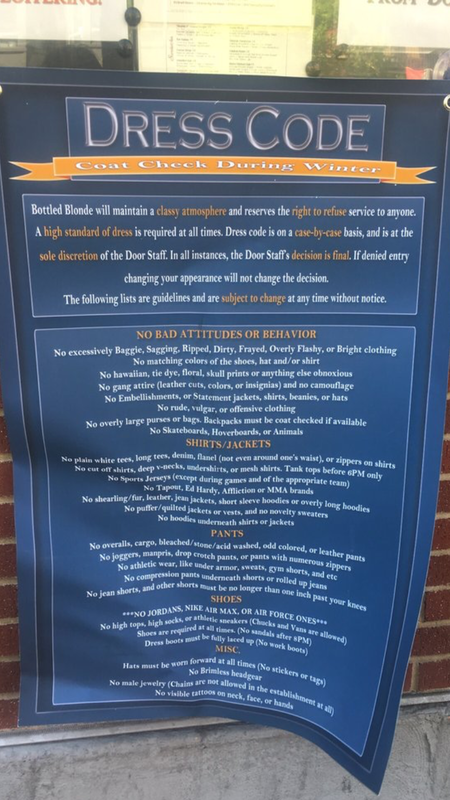 The restaurant’s dress code prohibits 30 different different styles, including “excessively baggy” clothing, plain white T-shirts and Jordan gym shoes. It was has been widely criticized online as a thinly veiled way of keeping out people of color. It isn’t an issue with Bottled Blonde’s case before the liquor board. The flagship Bottled Blonde location in Scottsdale, Arizona, has a similar dress code, though it is generally more “relaxed” during the week, depending on who is working security, an employee said by phone on Tuesday. A manager at Bottled Blonde declined to comment. Representatives for Evening Entertainment Group, which owns the chain, did not immediately respond to requests for comment.